I retired the Personal Branding Winner of the Month, but will award the You Get Award whenever I find someone who has a freaking awesome site/blog, etc. Joe Cockrell’s website is one of THE BEST that I’ve seen in a long time. Joe’s message is clear… how much clearer can it get? He’s a PR guy. He’s THE PR guy! You know what was jump-off-the-screen awesome? 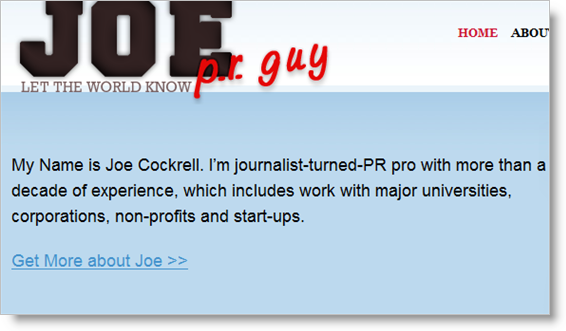 The design… Joe’s picture right there… you get to know the PERSON, not the website. You start to make a personal connection. You need to have me work for you. I LOVE it. Why doesn’t every professional have something like this? Go see what Joe the PR Guy has done. If I wanted a site like this I’d go get a bid from elance and probably pay less than $200 for it (only because I could tell the designer: “I want this, with these specific changes” (and then list the changes…)). Joe forwarded me your note, and let me just say that I am totally wowed and humbled by your compliments! (I designed the sucker, and do so often for PR peeps) Also, the same way that you’d never want anyone to go to The PR Shop, please don’t enter the evil world of eLance. Remember, you’re paying for my skills, responsibility and customer service as much as my charm:) Thanks again! I mentioned elance in the post because I’ve had good success with it, and it fits my budget.